In 2019, the Great North Run celebrates its 38th year as an integral part of North East culture. As one of the world’s largest races, the Great North Run is a prominent date in the sporting calendar for professional runners and keen racers alike. Capturing the Northern Spirit perfectly with its charitable causes and the support of cheering locals, it’s difficult to imagine what Newcastle and Gateshead would be without it. Last year's event also formed part of the final weekend celebrations of the Great Exhibition of the North in 2018. 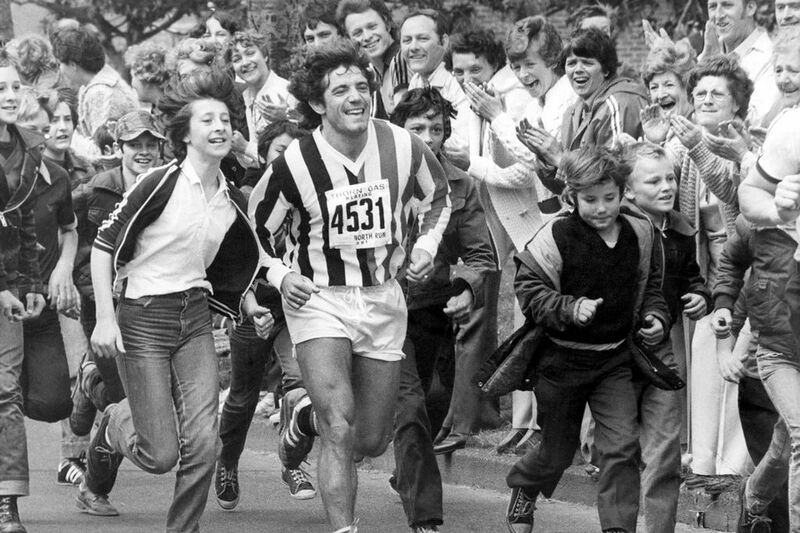 The Great North Run itself was inspired by former Olympic 10,000m Bronze medallist Brendan Foster. Foster had taken part in New Zealand’s Round the Bays Race in 1979 and wanted to create a similar fun run experience near his hometown of Hebburn in County Durham. He helped to organise the ‘Gateshead Fun Run’ in 1977, a pioneering event which would pave the way for the Great North Run to become one of the biggest half marathon’s in the world. Starting just outside the centre of Newcastle before crossing the famous Tyne Bridge into the borough of Gateshead, the race passes through some of the region’s most well-known suburbs before reaching the picturesque South Shields coast. The first race took place on 28th June 1981 with 12,000 runners participating, eventually becoming the largest running event in the UK. The first winner was British former Olympic 10,000m competitor Mike McLeod, who hails from Dilston in Northumberland. He completed the race in an impressive 1 hour, 3 minutes whilst Karen Goldhawk followed shortly behind as the first female winner with a time of 1:17. Alan Robinson also completed the first Elite Wheelchair race that year with a time of 1 hour and 28 minutes; later beaten by current record holders, USA Gold Medallist Amanda McGrory and winning British Paralympian David Weir, both in 2009. Weir completed with a time of 41:34 whilst McGrory crossed the line in 49 minutes, 47 seconds. Records for the Great North Run have been subsequently broken time and time again by the extended list of professional athletes who have taken part, including the North East’s own football star Kevin Keegan who once famously swore to give 50p to charity for each runner who beat him to the finish line. That year he ran bearing both colours of rival North East Teams, Newcastle United and Sunderland FC finishing respectably in 490th place, resulting in him donating £290 to charity. Another Newcastle football legend, Paul Gascoigne pushed a wheelchair athlete round the entire circuit one year whilst Olympic runner Mo Farrah has also taken part four years in a row in an attempt to beat the current record. 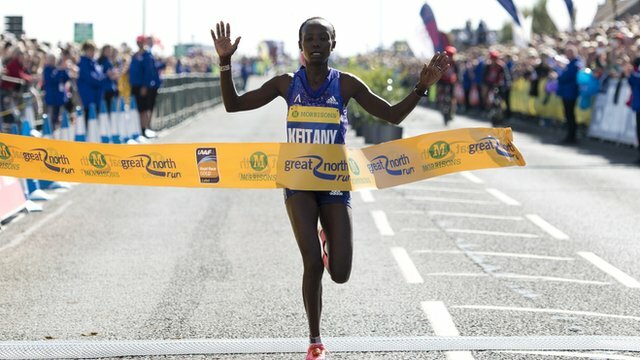 The Great North Run record for men and women, as it stands, are held by Kenyan runners Martin Mathathi who ran at a phenomenal 58:56 and Mary Keitany respectively who completed the run at 1:05:39. For the first nine years, eight of the races took place in June before eventually being moved to early Autumn after 1990 meaning that runners could enjoy more gentle temperatures compared to the hot summer climate. Since then, the run has traditionally taken place in September or October with numbers growing each year. In 2011, it was reported that 54,000 runners had taken part, succeeding the Gothenburg Half Marathon which had previously held the record as the world’s largest half marathon with 40,523 runners in 2009. In 2014, Tracey Crammond was the Millionth runner over the finish line which was a huge milestone for the event and this year is set to see even more entrants taking part. 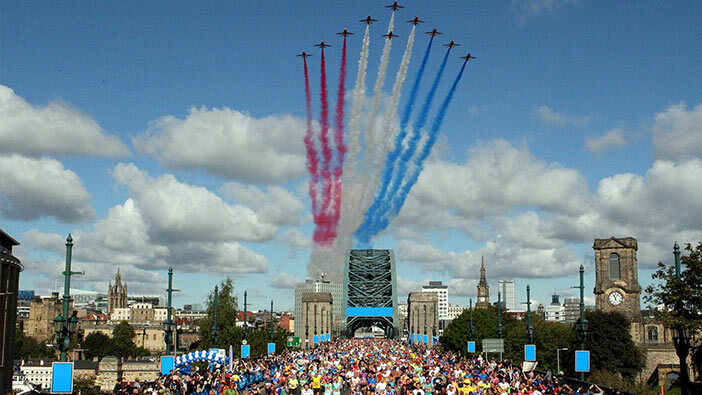 The Great North Run is one of the region’s biggest, brightest and best events with support and sponsorship hailing from all across the Newcastle and Gateshead area. If you want to be part of the UK’s biggest race, why not find out How To Enter and get started.